11 days from £2820pp plus international flights. Nepal really isn't just about trekking and temples! This trip shows just how much more there is to this fabulous country. Whether you're a couple, group of friends, or a family with children (we'd suggest from about 12-years-plus, mainly due to the rafting), you'll come away from this holiday with a huge smile on your face and incredible memories to treasure. The trip includes the 'must-see' sights in the Kathmandu Valley, such as Patan City, Durbar Square, Boudhnath and Swayambunath Stupas, and Bhaktapur. 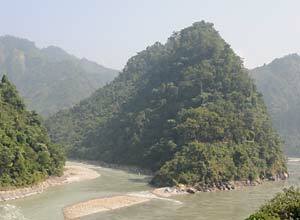 Then there is adventure - a white water rafting trip on the Trisuli River. It's mostly grade 2-3 rapids (no higher) so it feels thrilling and intrepid without being too scary for someone who's never done it before. 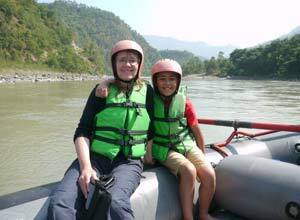 We stop the rafting an hour or so's drive away from Chitwan. Once here you start your wildife experiences, with jeep safaris, canoe rides and walks. With luck you'll spot some great birdlife and a variety of wildlife such as gharials, spotted deer, monkeys, and hopefully also the Asian one-horned rhino. Tigers are possible, but quite rarely seen, so seeing one would be a huge bonus. Heading back north you arrive at the ancient hilltop town of Bandipur en route to Pokhara. Here nature is the star, and you take walks, hikes and lake boat trips to enjoy it to the full. 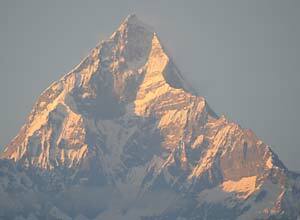 As for seeing the sunrise a lighting up the Annapurna Mountains, that's sure to be a highlight. It's all possible from here. Nepal really does put a smile on your face! Arrive at Kathmandu airport, where you are met and taken to your hotel. The rest of the day has been left free. Kantipur Temple House is a traditional Newari-style hotel within walking distance of the shops and restaurants of Thamel district, and close to Durbar Square, the plaza in front of the old royal palace and a UNESCO World Heritage Site. So there's plenty to go and see if you wish, but you are equally welcome to make yourself at home at the hotel and settle in as you rest after the journey. The capital awaits! 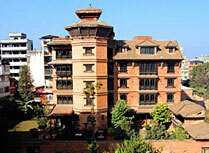 Today you have a tour of Kathmandu led by an experinced guide whose knowledge helps you appreciate all you see. You visit well known sites such as the much-photographed Swayambunath stupa, set atop a hill from where you get great views over the city. 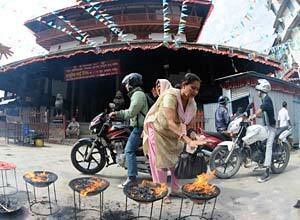 Your tour also takes in Patan City, possibly the oldest of the cities in the Kathmandu Valley. 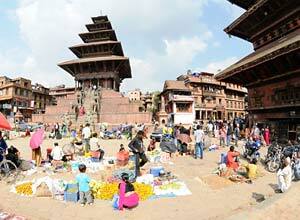 Like the capital, it has its own Durbar Square with many palaces and temples, a designated a UNESCO World Heritage Site. The tour is a wonderful insight into the area's rich culture. 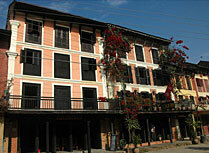 Tonight you have dinner at Bhojan Griha a restaurant offering traditional Nepali food and entertainment. Breakfast, dinner. Leaving the city behind you are driven to Charaudi on the Trisuli River. This is the starting point of an exciting whitewater rafting adventure. Trisuli River is excellent for those looking for a short river trip, without the challenge of huge rapids, but with some really exciting whitewater balanced with more placid sections where you can enjoy the beautiful scenery and the peaceful environment. In short, it's the ideal adventure for families with older children. The fun doesn't end on dry land, either: tonight you are camping on the riverbank, with a cook to create a tasty dinner. Great fun! Full board. This morning you continue rafting down the Trisuli for about another two hours. What a way to kick start your day! Your journey continues by road to Chitwan National Park, Nepal's first national park. It was established in 1973 to protect the rare Asian one-horned rhino, then on the verge of extinction, and now has a good population of these animals, as well as other wildlife. Check into Hotel Parkland, your home for the next two nights, Time permitting you are whisked off into the park for your first safari, a taster of what's to come tomorrow. Full board. 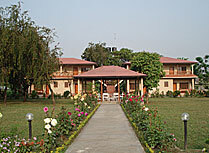 Your have a treat in store with the full day to explore Chitwan, its landscapes and wildlife. You head off to the park, mere minutes from the hotel, on a a thrill-packed six-hour jeep safari, complete with picnic lunch. 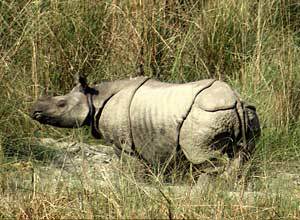 Rhinos are prized sightings and are sure to be amomg the day's highlights, but there's more to Chitwan. Elephants, deer, monkeys and crocodiles are frequently seen. There is abundant birdlife, too. If you're really lucky you may even catch a glimpse of the biggest of the big cats, the tiger, though they are famously elusive. There's plenty to keep the whole family enthralled. Back at the hotel, having showered, you gather to share wildlfe tales with fellow guests before dinner, reliving some of the day's highpoints. Full board. You have the bonus of a final morning in Chitwan, and another chance to enjoy its varied wildlife, before setting off to the ancient hilltop town of Bandipur with its mediaeval houses and temples. It was once a strategic stop on the important trade route between India and Tibet, attracting merchants from far and wide with their varied wares. Although its heyday may be gone, the town retains many examples of fine architecture from those days, visible on a stroll from your hotel. The hotel itself is a heritage property, originally a traditional Newari mud and brick house, carefully renovated to provide comfy guest accommodation. Full board. You can take most of the morning to explore Bandipur and get a feel for life in this hilltop town, before the drive resumes. Your destination is Pokhara, about three hours away. This is the third largest city in Nepal and one of the country's major tourist attractions. When you see it you'll understand why. The town sits beside tranquil Lake Phewa (Phewa Tal), and is in the foothills of the stunning Annapurna Mountains, perfectly reflected in the lake's water. It's undeniably scenic. 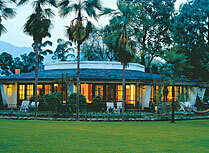 Your home here is Fishtail Lodge, the town's original lakeside resort set in lovely gardens. Relax and enjoy the views. Breakfast, lunch. It's time to go exploring, with a full-day guided tour of the picturesque city of Pokhara and its surroundings. You can take to the water on a boat trip and explore on foot, venturing into the foothills, with a choice of walking routes and durations, some leading to waterfalls and viewpoints. 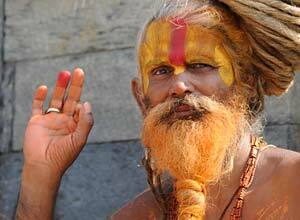 You can also visit local temples, adding a cultural aspect to your tour. It makes for a varied day, with the bonus of healthy exercise and fresh mountain air. At teh end of the tour you return to Fishtail Lodge for some well earned rest and relaxation. Breakfast. Today you return to the capital city. Flying reduces your travelling time to around 30 minutes and lets you enjoy fine aerial views. 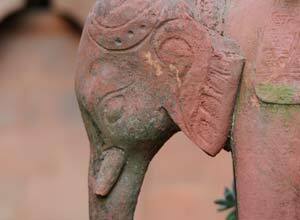 On arrival you are driven back to Kantipur Temple House for your final two nights in Nepal. You might like to go for a walk in the neighbourhood, maybe doing some souvenir shopping and locating a restaurant for dinner tonight. Breakfast. 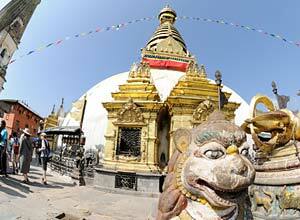 A full day touring the Kathmandu Valley led by an experienced guide is on the cards today. This region contains many important temples and monuments and your tour includes sites such as the famous Boudhnath stupa, one of the region's key landmarks. The Kathmandu Valley has long been home to the Newari people and you can see fine Newari architecture in many of the local villages and towns like Bhaktapur. Your guide can explain the history of the valley and its people to set it all in context. Back at Kantipur Temple House you can put your newly gained knowledge to use, spotting Newari influences in the ornately carved windows and eaves of this traditionally styled building. Later you enjoy dinner at the restaurant of your choice, before returning to the hotel. Breakfast. Enjoy breakfast at the hotel before, bags packed, you are driven to the airport in time for your home-bound flight. You need to fly to Kathmandu. There are no direct flights from the UK, so you need to go via India or the Middle East. Flights cost from roughly £700 depending on the date and availability. 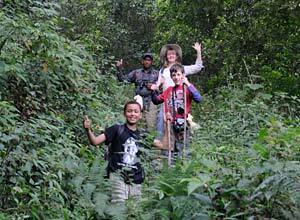 Departure dates: You can take this holiday any time you like as it is a private tailor made itinerary. 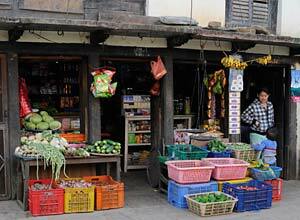 The small town of Bandipur straddles the ridge of a hill overlooking the Kathmandu-Pokhara road. About 3 hours drive from Kathmandu, Pokhara or Chitwan, it is a great spot to break your journey and explore traditional Nepalese life. About six hours drive, or a short flight, west of Kathmandu, Pokhara is the third largest city in Nepal and one of its major tourist attractions. Located in the foothills of the Annapurnas, Pokhara is picturesquely sited on the edge of Lake Phewa (Phewa Tal) with beautiful mountain views.